View by Brenton of the Narrows in St John’s Harbour, Newfoundland. Once a ship entered the Narrows, it was protected by the high cliffs which rise either side. There was an important fishery here in the 17th and 18th centuries with trade being divided Between the English and French. 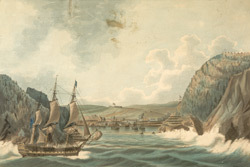 Control of the harbour was a significant issue and three forts defended the harbour and fishery - Fort William, Fort Amherst and Fort Townshend. These forts, which can be seen on the cliffs in this print were neglected during times of peace but in times of war were garrison by as many as three hundred soldiers.